The growing world economy and population has led to an increase in human settlements and industries which has resulted in increased pollution levels and other forms of CO2 emissions at an alarming rate. United Nations Environment Programme (UNEP) reported that approximately 80 to 90% of the energy consumption in buildings is utilized during a building’s operational phase. The remaining 10 to 20%, is used during extraction and processing of raw materials along with construction. The global population was growing at 1.13% as of 2016 and the global economic growth rate is 3.4%. Since the economic growth rate is currently higher than the population growth rate, the average standard of living is gradually increasing in the recent years. People are spending greater degree of money on improving their lifestyles, with facilities such as: - better lighting, air conditioning and other consumer electronics which consume high electricity. The increasing prices of electrical energy and high electrical energy consumption are some factors that has led building owners to switch towards energy management systems. The report titled “Global Building Energy Management Systems Market” provides an in-depth analysis of the key development strategies and market trend dynamics which includes drivers, challenges, and opportunities prevailing in both the industries. The report provides an extensive insight into various forms of developments, trends and key participants. While highlighting the key driving and restraining forces for this dynamic market, the report also provides a comprehensive in-depth analysis of the Porter’s five forces model of the building energy management systems market and an assessment of the factors governing it. 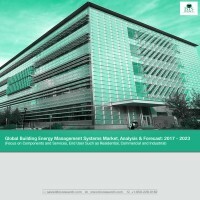 The Global building energy management systems market estimation has been built on detailed assumptions and limitations. The market has been estimated by the type of components and services, their usage across different applications, and geographical analysis. The report profiles 26 organizations across different geographies that allows the readers to gain an insight into the various industry trends. • What are the major market drivers, challenges and opportunities in the global building energy management systems market? • What is the supply chain for the global building energy management systems market? • What is the market value of building energy management systems market for different components (hardware and software) and services? • What is the market value of building energy management systems market for different applications on the basis of residential, commercial and industrial? • What is the market value of building energy management systems market on the basis of different geographical regions? • Which geographical location will dominate the building energy management systems market? • What will be the growth rate of different segments of the building energy management systems market during the forecast period? • Who are the key players for the building energy management systems market? • What is the market share of the leading players in the global building energy management systems market for 2016? • How attractive is the market for different stakeholders present in the market by using Porter’s Five Forces model? Increased level of energy consumption in the present era has gradually led to negative global environmental effects such as depletion of natural resources, global warming, and degradation of environment, among others. Sustainable development in the future would largely depend upon the efficient utilization of the available resources, therefore, understanding the importance of energy efficiency is crucial. Energy efficiency essentially refers to cost effective utilization of energy whereby energy waste and energy consumption is relatively minimized. Energy efficiency is critical for global economic and social development, therefore, it is essential to realize its significance. Higher energy efficiency aid in minimizing an organization’s operating cost and enhancing its profitability through better energy consumption management. Services acquired major revenue because of the understanding of the BEMS consulting and installation required by the end users across different buildings. The benefits associated with BEMS hardware such as reduction in buildings’ energy consumption by 20%-30%, reduction of payback period, along with automatic control of the functions of the buildings will drive the market during the forecast period. BEMS software utilize browser interfaces to provide a dynamic view of the building energy consumptions in order to enhance energy management and its usage. Access to this energy consumption data opens up new opportunities for building owners to enhance the operation of their systems, reduce costs, and validate investments in energy savings measures and system upgrades. Residential buildings account for approximately 40% of the total energy consumption. The prospective savings of energy efficiency in the residential vertical can substantially contribute to a worldwide reduction of energy consumption. Energy savings across the residential sector reduces the demand for energy which significantly contribute to a nation’s compliance with regulatory targets for the reduction of greenhouse gas emissions. The growth in the commercial application will be led by the increasing demand for energy security and sustainable development, along with environmental and social benefits. Commercial application vertical includes building types such as offices (government and private), retail stores, institutions (schools, colleges and universities), hospitals, shopping malls and hotels, among others. Approximately 30% of the energy resources on an average is wasted by the commercial buildings. North America dominated the global market in 2016. In the U.S. alone, organizations spend $100 billion on the energy of their buildings. In large urban areas such as New York and Chicago, energy consumption exceeds 70%. The vast majority of the current building stocks, specifically commercial buildings, will cross over 75% of the existing buildings in place by 2040. The APAC region is estimated to grow at a highest CAGR from 2017-2023 owing to development of smart cities and adoption of green technologies.